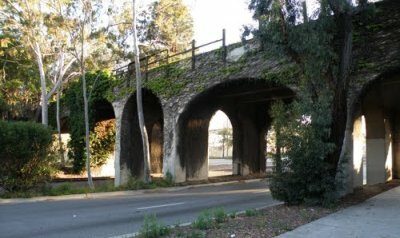 Historic 1913 Pacific Electric Railroad Bridge spanning Torrance Blvd. The popular Bach's Lunch Recitals, a favorite in the South Bay community for two decades, are now First Fridays at First! ~ fff, graciously hosted as a gift to the community by FirstServe Community Services, the nonprofit community service partner organization of First Lutheran Church & School – Torrance. The finest artists from Southern California and around the World perform half-hour lunchtime recitals. For information, call Classical Crossroads at (310) 316-5574 or click here. Friday, September 7, 2018 at 12:15 p.m. Playing from the heart defines Namhee Han's approach to music making. 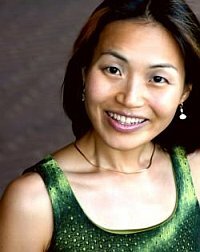 Namhee holds Master's and Doctoral degrees in organ performance from UCLA. She has been a featured artist at National and Regional Conventions of the American Guild of Organists. A favorite on numerous Classical Crossroads' concerts when they resided in Manhattan Beach, Namhee Han is making her fourth appearance at the Torrance venue. She performs on Southern California's leading organs including the magnificent instruments at the Cathedral of Our Lady of the Angels and First Congregational Church of Los Angeles. Friday, October 5, 2018 at 12:15 p.m. Laureate of the prestigious Thibaud-Long International Violin Competition in Paris (1995), Ken Aiso has performed widely in the most prestigious concert halls of Europe, the U.S., and Japan, with appearances at the famed Concertgebouw in Amsterdam, the Musikverein in Vienna, and Wigmore and Queen Elizabeth Halls in London. Trained at the Royal Academy of Music in London, where he later taught, Ken Aiso is an iPalpiti alumnus and an Associate at the Royal Academy of Music in London. His playing is praised not only for his singularly beautiful tone, but also for the unique atmosphere of intimacy. In 2003 he was honored to appear before the Emperor and Empress of Japan. Pianist Valeria Morgovskaya graduated from the Kiev State Conservatory in Ukraine, and is in high demand as accompanist for leading singers and instrumentalists. She has been an official accompanist for the Piatigorsky Cello Seminar and Beverly Hills Music Festival and has provided accompaniment for the Schoenfeld International String Competition in Hong Kong (2013) and Harbin, China (2014). Ms. Morgovskaya is currently staff accompanist at Loyola Marymount University and UCLA. 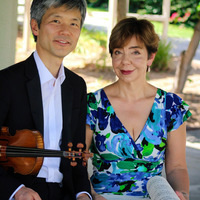 Ken and Valeria will play favorite encores from the violin repertoire and Pablo de Sarasate's virtuosic gypsy-inspired masterpiece Zigeunerweisen (Gypsy Airs). Friday, November 2, 2018 at 12:15 p.m.
Now in its 15th season, the Hausmann Quartet has established itself as an integral part of the cultural life of Southern California as faculty Artists-in-Residence at San Diego State University and Ensemble-in-Residence at Mainly Mozart. 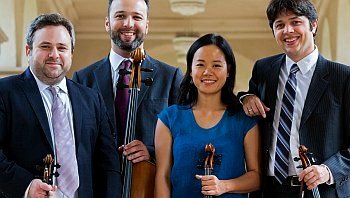 Winner of the Beverly Hills National Auditions, the Rotenburg International Chamber Music Competition, and the Morrison International Fellowship Award, the Hausmann Quartet was one of only two American quartets chosen to participate in both the Beijing International Quartet Competition and the Banff International Quartet Competition. The quartet is named after Robert Hausmann, the eminent 19th-century German cellist and founding member of the Joachim Quartet. The Hausmann Quartet and the Maritime Museum of San Diego have partnered to present Haydn Voyages: Music at the Maritime, a quarterly concert series aboard Berkeley - an 1898 steam ferryboat that operated for 60 years on San Francisco Bay. Concerts aboard this National Historic Landmark, docked in downtown San Diego next to Star of India, explore the evolution of the string quartet through the lens of Joseph Haydn's quartet cycle. Friday, December 7, 2018 at 12:15 p.m.
"Most appealing . . ."
A native of New York City and based there, Ben Capps received a Bachelor's degree at the Manhattan School of Music and a Master's from Juilliard, both under the guidance of the great David Soyer of the Guarneri String Quartet. He recently earned a Graduate Diploma at New England Conservatory in Boston, where he was a student of noted cellist Laurence Lesser. Ben Capps has performed in New York at Carnegie Hall's Stern Auditorium and Weill and Zankel Halls, and at Lincoln Center's Avery Fisher Hall and Alice Tully Hall; in Washington D.C. at the Kennedy Center; in Dallas at Meyerson Hall; and in Mexico City at the Auditorio Nacional, Palace of Fine Arts, and Sala Nezahualcoytl. As concerto soloist, he has appeared with the New York Concerti Sinfonietta, the Manchester Music Festival Orchestra, and the Philharmonic Orchestra of the Americas, where he is Principal Cellist. Friday, January 4, 2019 at 12:15 p.m. These three consummate ensemble artists and good friends are favorites among Southern California aficionados. Flutist Susan Greenberg was a member of the LA Chamber Orchestra for 36 years, where she was a frequent soloist on both flute and piccolo. She has also appeared as guest soloist with the San Francisco and Oakland Symphonies, the Santa Monica Symphony, the Napa Valley Symphony, and at the Hollywood Bowl. About Jon Lee Keenan's solo role with the Los Angeles Master Chorale's "St. Matthew" Passion, Los Angeles Times' Mark Swed wrote, "As the Evangelist, Jon Lee Keenan offered a clarion tenor and commanding narrative style." After graduating in his home town from UNLV, Jon earned a doctorate in Vocal Arts from USC. Since joining the Los Angeles Master Chorale in 2007, Jon has appeared as a featured soloist in each season. Guitarist, composer, and educator Kenton Youngstrom is the first in a long line of prize-winning students of the late Jim Smith at USC, where, while earning his Bachelor and Master of Music degrees, he studied composition with Donald Crockett, arranging with Darniell Pershing, and film scoring with David Raksin. Kenton joined the faculty of the Colburn School of Performing Arts in 1979. Friday, February 1, 2019 at 12:15 p.m. 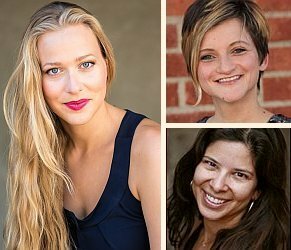 This recital brings together three consummate artists and Beverly Hills National Auditions winners for a performance that will feature Brahms' much-loved Viola Songs, which Brahms composed as a gift for the great violinist Joseph Joachim and his wife Amalie. Other selections will fill out the program. Polish-born, Los Angeles-based, Canadian mezzo-soprano Katarzyna Sadej has sung internationally in some of the world's leading venues. She made her L.A. Opera debut as The Page of Herodias in Strauss' Salome. Other recent debuts include her San Diego Opera role as Kate Pinkerton in Puccini's Madama Butterfly, and as River Voice in the world premiere of Hopscotch by L.A.'s cutting-edge contemporary-opera company, The Industry. Violist Alma Lisa Fernandez has been described by LA Times' senior music critic Mark Swed as "...a soulful violist." She is a member of the Eclipse Quartet, and as a member of the Denali String Quartet, she performed the world premiere of Ben Johnston's Revised Standards on the Jacaranda series. Alma also performed the West Coast premiere of Tigran Mansurian's Percussion & Viola Duet. Polish-American pianist, Basia Bochenek's passion and dedication for collaborative arts brought her to venues throughout the North America and Europe. Basia co-founded the Kasia & Basia Duo with mezzo-soprano Katarzyna Sadej. Friday, March 1, 2019 at 12:15 p.m. Formed in 2005 as Duo Ondine by flutist Boglárka Kiss and harpist Alison Bjorkedal, the duo invited their good friend and violist Alma Lisa Fernandez to join them to explore the unique repertoire for flute, viola, and harp that Debussy debuted in 1915. Duo Ondine is a winner of the Beverly Hills National Auditions, which Alison also won as a solo harpist and Alma won as a member of the Eclipse Quartet. Praised for her "rich and full tone," flutist Boglárka Kiss performs as a soloist, chamber and orchestral musician, and a recording artist for film and recording projects in LA's studio scene. 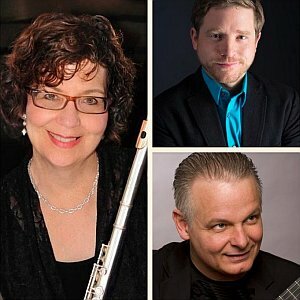 She performed the U.S. premiere of Endre Szervánszky's Flute Concerto, and premiered American works in her native Hungary, such as the Flute Sonata of Grammy-winning composer, Billy Childs. Described by LA Times' Mark Swed as ". . . a soulful violist," Alma Lisa Fernandez performs regularly with the LA Opera Orchestra, LA Master Chorale, and the Long Beach Symphony. She gave the world premiere of Ben Johnston's Revised Standards with the Denali Quartet on the Jacaranda series. She has also worked closely with composer Tigran Mansurian and gave the West Coast premiere of his Percussion & Viola Duet in 2007. Friday, April 5, 2019 at 12:15 p.m. 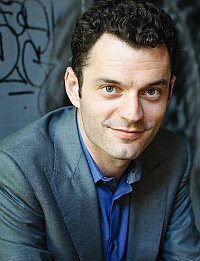 Hailed by the Los Angeles Times for his 'impressive clarity, sense of structure and monster technique', Steven Vanhauwaert has garnered a wide array of accolades, including the First Prize at the Los Angeles International Liszt Competition. Mr. Vanhauwaert has made his solo debut at Walt Disney Concert Hall performing the world premiere of Magnus Lindberg's Fratello. 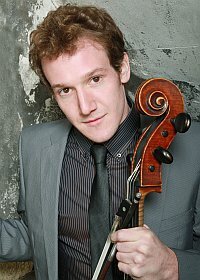 He has appeared as a soloist in some of the world's leading venues, including the National Center of the Performing Arts in Beijing, the Shanghai Oriental Arts Center, the Concertgebouw in Brugge, the Great Hall of the Budapest Liszt Conservatory, the Forbidden City Theatre in Beijing, Segerstrom Hall, and the National Philharmonic Hall in Kiev, and with the Pacific Symphony, the Lviv Philharmonic, the Sofia Sinfonietta, the Flemish Symphony, and the Kyiv Kamerata, to name just some. Recent albums such as Joseph Woelfl: The Paris Years (Sonarti Records) and Pensées Intimes (Hortus Records) were included in the Top 10 award on Belgian radio and received a 5 diapasons rating in France. His album Dispersion (Hortus Records) featuring works by Hindemith, Vierne, Casella, Schulhoff and a world premiere recording by Belgian composer Raymond Moulaert, received rave reviews in Germany, France, Holland, the UK, and the US. Mr. Vanhauwaert is a Steinway Artist. Friday, May 3, 2019 at 12:15 p.m. In cooperation with the Peninsula Symphony, each year Classical Crossroads presents the winner of the Knox Concerto Competition in recital on the First Fridays at First! series. 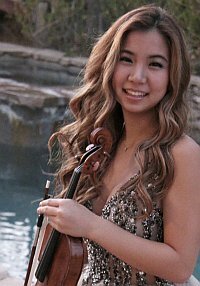 This year's winner is 16-year-old violinist Audrey Park, who attends West Ranch High School in Stevenson Ranch CA. She will perform the Sibelius Violin Concerto with the Peninsula Symphony on Sunday, June 30, 2019. In addition to her recent win of Peninsula Symphony's Edith Knox Performance Competition, Audrey was the winner of the Santa Clarita, San Fernando Valley, Gail Newby, and Parness concerto competitions, as well as numerous other instrumental competitions. She was selected to participate in NPR's nationally syndicated program From the Top, and was invited to participate in Glenn Dicterow's, Cho-Liang Lin's, and Jan Sloman's masterclasses. Audrey performed with guest artists Hilary Hahn, Gil Shaham, Adele Anthony, Cho-Liang Lin, and Kyoko Takezawa at the La Jolla Music Society Summerfest. Audrey currently studies with Ms. Linda Rose. Friday, June 7, 2019 at 12:15 p.m. The DSCH - Shostakovich Ensemble is a Lisbon-based Portuguese project with an international dimension. It is represented here by acclaimed artists: pianist Filipe Pinto-Ribeiro and violinist Corey Cerovsek, A chamber ensemble of variable geometry, the Shostakovich Ensemble constitutes a platform for interaction of musicians of excellence on the international scene, masters of their instruments, compelled by the pleasure of making chamber music and a deep artistic complicity. It was created under the artistic direction Filipe Pinto-Ribeiro in 2006, the centennial year of the birth of the composer Dmitri Shostakovich, to whom the ensemble owes its name. The hidden musical signature of Dmitri Shostakovich, the DSCH cryptogram created by the composer based on the first letters of his name and nickname, that is, the thematic musical motif "D - E-flat - C - B natural," is found in some of his most significant works.